With Harriett’s help, the nest construction progressed rapidly. Harriett was pleased with the site. It was high in a tree top, safe from ground predators, had clear visibility and an abundant food supply swam just below. 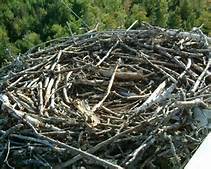 The nest looked like a bulky mass, five feet in diameter and six inches thick, but the tightly woven branches and sticks made it home. Ospreys have few natural enemies. Mostly the eggs and the young are victims of predation, but sometimes, even adults especially incubating females are snatched from their nests by owls, under the cover of darkness. Eagles are another avian threat to osprey. Osprey and Eagles do not get along. Even though ospreys, especially the males, fiercely defend their nests, a determined raccoon, fox, skunk or similar land predator might raid the nest to steal eggs or chicks. Ospreys tend to avoid these perils by building their nests on isolated spots such as islands, secluded trees, or on top of man-made structures such as nesting platforms, electricity poles and other, similar, hard to reach spots. The male osprey is a formidable predator, himself. He is a very large raptor, a bird of prey, with an average body length of two feet and a wingspan of over six feet. His sharp hooked, cycle shaped, beak easily tears flesh from his adversaries, not to mention razor sharp talons with death grip strength. Before the presence of industrial humankind, Ospreys were widespread and abundant. However, the presence of guns, chain saws, toxic chemicals, synthetic fish nets and other modern products have brought harm to the osprey’s environment. All-in-all, however, ospreys have survived recent ecosystem changes fairly well. Being fish eaters, they were one of the many species that were affected by the use of the pesticide DDT. Egg shells of the osprey became thin and weak, and reproduction was essentially extinguished. A ban on the use of this chemical in the United States led to a resurgence in osprey populations. Although the threat is gone in the U.S. and Canada, DDT is still used in other developing countries like Venezuela, and residues continue to be present in osprey tissues today. Other threats include power lines, gunshots, and other forms of poisoning. Polluted lakes, rivers, and streams, and the loss of forested habitat along major waterways are additional threats. This is a video. Click the arrow. If you did not realize the last post also contained a video, you missed a good one. 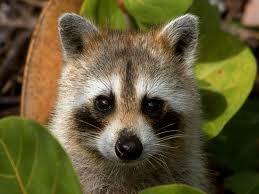 Raccoons, snakes and other climbing animals are the major predators of osprey eggs and nestlings. Selection by such terrestrial predators may explain why the majority of osprey nests are built over water. Crocodiles sometimes kill ospreys bathing and roosting near water during the winter season. Skunks also have an affinity for osprey eggs. “I’d like to tell you the story of Reggie”, said Harriett. But, I worry it is “over the top”. I am concerned it may be distasteful to some of The Doctor’s readers. If so, please give him some feedback, so I will know what is appropriate, and what is not on this website. Reggie and his disease was the most horrifying experience of my life, and I feel I should share it with someone. My vote: Nothing “over the top”. I like the stories just as you have them. Very Informative! I enjoyed reading this today. I am receiving OSPREY TALES in TN second hand from Emily Vaughan. How can I get my own subscription as I am enjoying the life of Ozzie ahd Harriet and don’t want to miss a single installment. We live on the TN river in Knoxville and delight in Spring and Summer viewings of our osprey as we visit their nesting sites by boat. I definitely want to hear about Reggie and looking ahead, I’ll just bet he has rabies but hope it isn’t true. Reading about critters is always of interest particularly when there is a narrative with the facts to go along. Go to https://ospreytales.wordpress.com/. Look to the right of the page and “subscribe by e-mail”. The chapter on the predator, Reggie Raccoon, got censored. You are correct; he did contract rabies and it was not a pretty site. Thank your for your comment. I very much enjoy the feedback. Perhaps some time in the future I’ll tell you about Reggie privately. I’m afraid it was “over the top”. Go to https://ospreytales.wordpress.com/ . Look to the right of the page and “subscribe by e-mail”.